Dr. Elena Gardner, one month from completing her residency in Family Practice, needs a life change. After her husband, Mark, develops an aneurysm, Elena’s life revolves around caring for him and making the difficult decision of withdrawing life support. Though he will never again live a satisfying life nor would he have wanted to be kept alive by artificial means, she hesitates; however, shortly after she actually signs the DNR (Do Not Resuscitate), Elena learns someone else has already pulled the plug on his ventilator. The hospital administrator accuses her of mercy killing. Elena admits her only misdeed is in signing the DNR, stating she is not responsible for how he died. Overwhelmed by grief and a ton of debts, including her medical school tuition and Mark’s funeral expenses, Elena is soon tormented by frightening phone calls every Tuesday evening at midnight. The caller sobs, saying, “I know what you did and you will pay.” Terrified, Elena believes Mark’s mother is responsible, for the woman never accepted her as Mark’s wife. Another patient arrives in the ER presenting the same symptoms as Mark, and Elena determines she must do everything possible to help him. Delivering the grave diagnosis, Elena ingratiates herself with the patient’s wife, suggesting she release him from his vegetative state. This woman is loathe to take the steps, so Elena signs the form, hoping to ease the woman’s burden. Shortly afterward, the ventilator is found disconnected and again and suspicions lead to Elena—though she swears she is not responsible. With only a few weeks left to complete her residency, Elena lands a position working with another doctor who will soon be out for maternity leave. Happy as she is to begin her life in a new town, she soon finds her troubles have followed her. Someone is clearly setting her up and trying to frame her. Could it be her mother-in-law? Would she be that devious? Who else would want to destroy Elena? This riveting and in-depth medical thriller is a page-turner. Dr. Richard Mabry knows of what he pens, but does justice to the layperson without using tons of medicalese. The story contains strong emotions without the use of profanity or vulgarity, which proves to be refreshing. 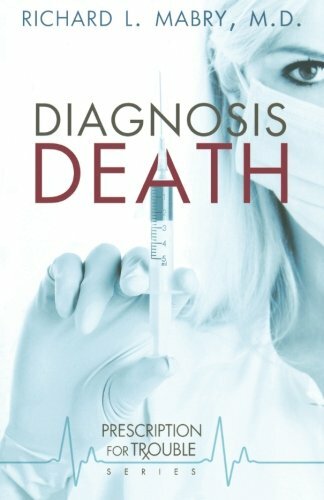 Diagnosis Death proves that he is an author to watch.